We are proud to announce that, after many exhausting days of hard work, we are ready to present the very first release of the JDBC Driver we are developing, Milestone 01. This pre-release is featuring the minimum viable snippet and a minimum interfaces implementations to have it working. We decided to use a modular architecture and we are currently working on the BOLT module. It use the brand new BOLT protocol, wrapping the well enginereed official neo4j-java-driver. The Driver is supporting Statements, using executeQuery and executeUpdate methods, we are currently working on PreparedStatements that will probably be released in the next milestone. A new feature that we added is the handling of nodes and relationships that will be returned as maps with specific parameters for labels and properties. To read more about this please refer to the documentation in GitHub. We added a complex logging system that, as developer, you can use to debug the driver. We run the very first performance test and we are exited of the results, stay tuned, we are working hard looking forward to GraphConnect. 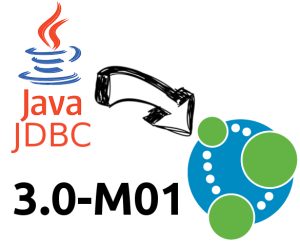 The driver now uses M04 of Neo4J 3.0 server and its java driver. We implemented the code for transactions and the use of autocommit, satisfying JDBC requirements.